LG 42PW450T review | What Hi-Fi? 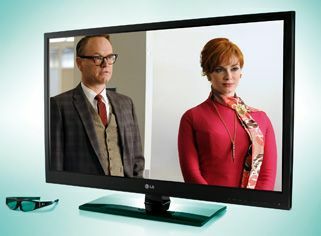 The unofficial award for ‘most intriguing/bewildering TV’ in this size sector undoubtedly goes to the LG 42PW450T. As it’s the least expensive screen we've seen at this size (and it’s yours for close to £400 if you do the legwork), we were primed to accept some holes in its specification, but the 42PW450T gives with one hand and takes away with the other in head-spinning fashion. On the plus side, this is a blandly handsome 3D-ready plasma screen at a bargain-basement price. It benefits from LG’s exemplary on-screen menus, has a remote control with a realistic number of buttons and is simple to set up to your satisfaction. There’s a Freeview HD tuner, and the set will also play back high-def DivX files via its USB socket. On the other hand – and surprisingly – this is an active-shutter 3D screen from a company that’s currently involved in a huge rumble with its rivals over its assertion that passive 3D is the superior tech. And this is a TV with a resolution of just 1024 x 768 – numbers that might just have been acceptable in a 42in plasma three or four years ago. It follows that Blu-ray, Freeview HD or 3D images need a lot of processing before they’re downscaled sufficiently to be displayed. That remedial resolution aside, though, the LG does (mostly) enjoyable work with HD sources. Pictures from its high-def tuner are detailed and reasonably poised: picture noise is at a minimum, contrasts are strong and clean, and the 450T does a nice line in skin-tones and textures. Blu-ray pictures are very watchable, too – the colour palette is broad and convincing, and detail is reasonably high even in darker scenes. The LG finds complex patterns tricky from either source, though, and if these are combined with horizontal movement the results can be rather shimmery. Upscaled DVD pictures come close to matching downscaled Blu-ray images (which, given the panel’s resolution, isn’t a huge surprise). Season 4 of Mad Men is delivered with convincing colours, plenty of detail and little picture noise. Only the LG’s anxiety with motion-tracking spoils an otherwise-accomplished performance. Officially, the 450T isn’t supplied with 3D glasses, but any number of retailers will throw a pair or two of LG’s not-particularly comfortable 3D specs in – and it’s possible that 3D content is where the 450 is at its most impressive. Despite the manufacturer’s disdain for the technology the 450T’s active-shutter system works well, minimising cross-talk and keeping images decently bright while offering convincing 3D pictures. From any source, sound is pretty dismal: thin and reedy, and really quite tiring over time. And while we’re having a bit of a moan, the LG’s glass screen is indecently reflective, which can make watching darker scenes a bit of a trial. But at the price, the 450 combines ‘cutting-edge’ with ‘outmoded’ with occasionally brilliant results.